2 Cows explains in simple language the world's secrets no one ever told you. Every nation sees itself as superior to all other nations. Patriotism is universal. It is built partly on fact but mostly on myths created by its people and government. Americans believe we are superior to other nations and can tell you why. Britishers think they are superior and can tell you why. Germans are convinced they are and can, with apologies, tell you why. The French believe it more firmly than most, though they are unsure why. The people of Libya, a country three times the size of France and a sponsor of what Americans call international terrorism, believed leader Mu'ammar al-Qadhafi was the greatest living person, and believed their nation was the world leader in moral values. They believe it so completely that the CIA rated Libyans the most patriotic people on earth. Everyone with a god is convinced it sides with them. On that reliance will muslims and U.S. Marines each lay down their lives for a cause, and parents sacrifice their children. Patriotism comes from exaggerations and lies dunned into our heads. "Be very, very careful what you put into that head, because you will never, ever get it out," warned Thomas Cardinal Wolsey in the 16th century, a wise man we still quote today. "We are the best" is taught in every school in the world. All countries control school texts to promote their government, their economic system, their superiority. For the US, Texas sets the model for all our states: schools are "to indoctrinate democracy, patriotism, and the free-enterprise system." Convincing people they are the greatest and their government worth dying for is easy, so every government is successful. Children believe authority. First interpret history so you look good, then create myths of moral superiority. Your young are now willing to die for you unless someone re-programs them. Which isn't easy. As Mark Twain observed, "You can't reason someone out of something they weren't reasoned into." We are raised on self-serving lies. Some are incidental; some are deliberate. Government knows the simple rule on which marketing is based: the Big Lie. Base your ad on what the product doesn't have. Proclaim loudly that your weak point is the strongest. It works. People believe you. Example? Most everyone in the US has seen the Energizer Bunny beat his drum claiming his alkaline battery "will keep going and going and going." Longevity is Energizer's whole advertising campaign. Is it true? No. Independent testing organizations like Consumer's Union report the Energizer has the shortest life of the major alkaline batteries. So they advertise it's the longest, and that's perfectly legal. Advertising agencies dispense billions of dollars promoting big lies. J.D. Powers, for one example, turned distorting surveys into a science. The crime for which Socrates was condemned to die by hemlock poisoning was "making the worse appear the better cause." That was then. In today's world that is a lawyer's stock in trade and the aim of most Political Action Committees and lobbyists. We're so accustomed to being told wrong is right that juries trusted to do the right thing often betray that trust. Finding OJ Simpson not guilty of murder was especially notable. Here are some examples of American history bunk our country thrives on and you probably believe. Your school history book told you the British burned the US capital during the War of 1812. Poor, mistreated us. Neither the book nor the teacher pointed out that we burned Canada's capital the year before and the Brits were settling the score. That's why you just learned that. No one told the teachers either. Our moral superiority to the British evaporates if history isn't doctored to make us look good. Every nation alters its history. True history would show bad as well as good, a no-no. No dream is free. To dream we forsake reality. Dreams come true only for those who wake up. For the most part those immigrants were people who left home because they had nothing. When you have nothing, you have nothing to lose. They came from the group that hadn't made it, or lost what they had and chose to start anew in a new land. In truth our forebears were largely Europe's losers and those Africans whose chiefs captured and sold them. We glamorize them because some deserve it. Those who were strong did not take losing lying down, for which they deserve respect. Does that explain why many Americans find it easier to bond with incompetent politicians and oppose the best and brightest? Democracy allows people to choose leaders they can relate to. The flaws of who we elect mirror our own. We aren't taught that. Children are taught leaders are wise. Few of us reach true knowledge by unlearning what we were taught. Historians writing textbooks love President Woodrow Wilson. They relate to him. He was a college professor and the president of Princeton before he entered politics. Unlike most politicians, he came from the intellectual side of town, their side. They idolize him as America's philosopher-king, as indeed he was. Historians praise his championing the League of Nations. He undertook a noble and costly fight for a good cause that appealed to historians, so the school textbooks they write talk of Wilson in glowing terms. But they omit that Wilson, a southerner, brought racism back into government hiring, and was one of the most racist presidents of all time. It's not acceptable for a philosopher-king to be racist, even now. The latest PBS Wilson documentary glossed over that in maybe 30 words and one slide. Textbook writers also fail to mention that on the sidewalk outside Wilson's White House was a permanent circle of women gathered around a fire burning Wilson's speeches. Why? Woodrow Wilson, philosopher-king, was the most powerful voice of his day against giving women the vote. There wasn't one word about that in the PBS biopic. Historians couch in soft terms, if they mention it (PBS did not), that Wilson sought campaign contributions and support from the most despicable big money self-interests on Wall Street. Then he repaid them by sending US Marines to invade more countries south of us than any President before or since. The purpose? Labor exploitation. Woodrow Wilson was the father of banana republics, that league of cruel and corrupt nations south of us beholden to United Fruit and other US business interests. The philosopher-king validated the concept of colonialism-without-responsibility. Wilson's policies destroyed the chance for successful democracies in South and Central America - and the lives of millions - by giving big landowners everything and the firepower to keep it. To stay in the White House, the philosopher-king knowingly allowed himself to be used by evil interests for evil purposes, and aided them. What does this say about the belief intellectuals are morally superior? Would it damage Wilson's credibility as the philosopher-king and the champion of the League of Nations to teach a balanced view of him? Absolutely. It would raise issues about his motives. It would teach us that philosopher-kings use lying, corruption, and opportunism just like other politicians. And most of all, it would let ordinary people see a side of US morality they're not supposed to see, not if Marines are expected to die for our morality. Government demands unquestioned loyalty. "But Sire ..." is not music to the king. "But Sir ..." is not music to the command. Everyone in the US learns that President George Washington is called the father of his country, was an important military leader, and thinks he had wooden teeth (he didn't.) We know he lived at Mount Vernon; we know his wife's name was Martha. We may even know he was a wealthy slave owner. But our history books seldom tell us how the first president earned a living, and why he became widely popular in his day. Do you know? George Washington was the largest distiller and supplier of rye whiskey in the country. American culture awash in hypocrisy doesn't want us to associate the father of our country with alcohol. We are taught so many myths. We recite cliches as truth. "No two snow flakes are alike." Generations of teachers told you that and still do. In the 21st century at least one self-proclaimed "snow flake scholar" is claiming it's true, yet only a few thousand flakes have been examined out of the trillions that fall every year. Ok, pay attention new age flake scholars like Ken Libbrecht of Caltech, because mis-education blinded you to common sense within the grasp of cavemen. The number of snow flakes is unlimited; the number of unique 6-pointed crystal designs and the number of triangular designs are not. No two alike? Quite the opposite. With infinite time to create snow flakes, every snow flake design will be duplicated an infinite number of times. And that will be just as true if and when they discover more shapes. But the falsehood that no two snowflakes are alike will never die. Here's another favorite. The rotation of the earth controls which way water swirls down the toilet, clockwise in the southern hemisphere and counter-clockwise in the northern. Your science teacher told you that, as do most science programs on TV. That's another myth we all believe. What's the truth? The rotation of the earth, termed the cariolis effect, is too weak to affect small bodies of water. It can gurgle down to the left or the right whether north or south. Check it out with the Library of Congress or even better, test it yourself. We think everyone in science is intelligent. That's not true. The stupid and the average, no less than the bright, can major in a science and have a career in it. Most workers in scientific fields are average people with specialized training. So it's no surprise to hear scientists claim, to pick a common example so many are guilty of, that a planet without water cannot sustain life. Of course it can; just not life forms that need water. But it takes intelligence to see beyond your own kind. Astronomers announce that the orbs they discover "have no life" when they know nothing but the surface and the atmosphere. Life cannot exist underground? Of course it can. Earth itself has complex life forms living a mile below the surface. We discovered worms there in 2010. While science fiction requires intelligence, actual science is 95% training - following formulas and repetition and doing what you were taught. So it's no surprise to find just as much religion and superstition among scientists as in any group. Most Americans, scientists and engineers included, believe the hand-me-down ignorance that 13 is an unlucky number. Multi-story buildings are built with the 13th floor labeled 14, evidence of the power of stupidity. Unlucky? Our country began with 13 colonies and had 13 signers of the Declaration of Independence, 13 stripes on our flag, and 13 letters in "E Pluribus Unum." The most powerful nation on earth was built on the number 13. It's especially absurd for African Americans to have triskaidekaphobia (fear of 13) since the 13th Amendment abolished slavery. 13 letters in a name? Robert Redford, Jennifer Lopez, Britney Spears. The 13th element in the Periodic Table: Aluminum. The 13th US president: Millard Fillmore who died peacefully at 74 after founding the SPCA. Americans should associate 13 with patriotism and good luck. It would be our national number, were it not for people passing on superstitions to children. If you do this, please stop. Myths take many forms. Would Ralph Lauren have his name on our clothes if he hadn't changed it from Ralph Lipschitz? Could John Wayne have become heroic as Marion Morrison? Would Judy Garland make hearts throb as Frances Gumm? Would Jon Stewart make it on Comedy Central if he had remained Jon Liebowitz? Could Florence Nightingale Graham have sold cosmetics without becoming Elizabeth Arden? Here are ten myths indoctrinated into American minds which are not true. 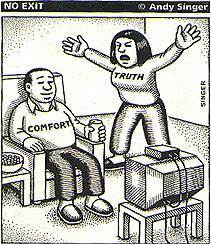 Which do you feel is better, perpetuating myths or telling the truth? You know where I stand.